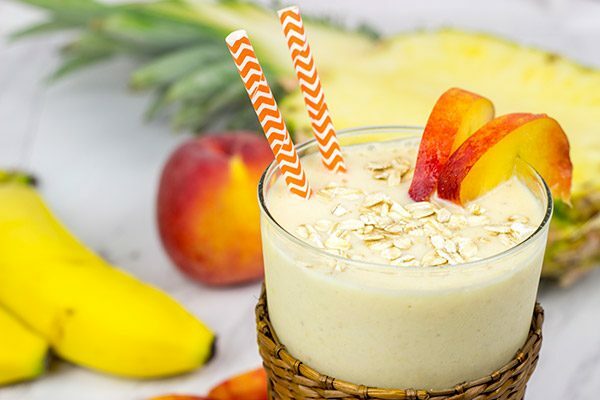 This Pineapple Peach Oatmeal Smoothie includes toasted oats for an extra layer of flavor. It’s perfect for warm summer days! We’ve had a bunch of rain this week, but fortunately the weather was great when Laura was out of town. Robbie and I enjoyed cruising around the yard each afternoon. It was a great way to show him new things…and also a great way to entertain him until dinnertime! One of the things I taught him during the Daddy-Robbie Week of Fun was how to smell flowers. He calls them babbers, but it’s close enough. As you parents out there know, you become an expert at translating toddler talk into English. So once Robbie understood flowers, I taught him to go up and smell them. And now he can’t stop smelling flowers! 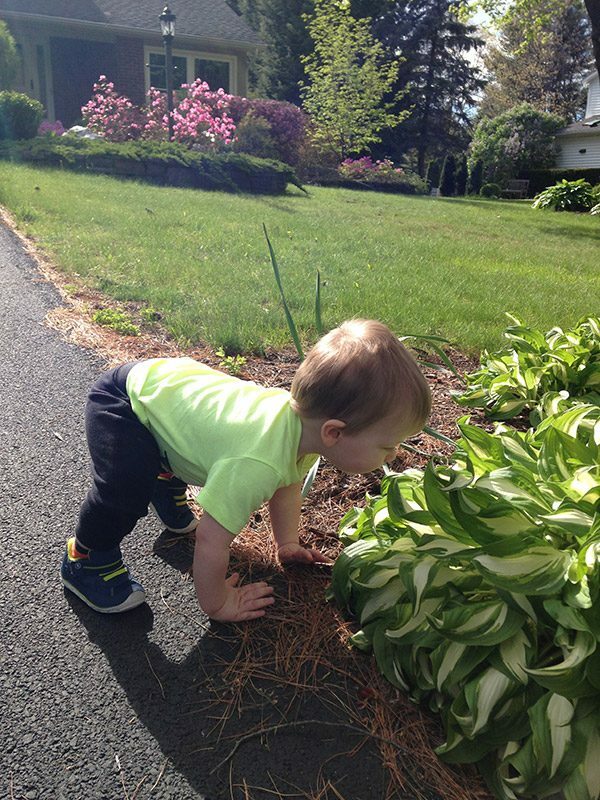 In fact, Robbie’s love of smelling flowers has led him to smelling everything that’s green in the yard…flower or not. The leaves on the hostas? Robbie smells ’em. The leaves on the tulips? Robbie smells ’em. (The tulips themselves have already flowered, but the leaves are still there.) And then he took it to a whole new level by smelling (and then picking) a dandelion. I mean, I get it! It does look like a flower. 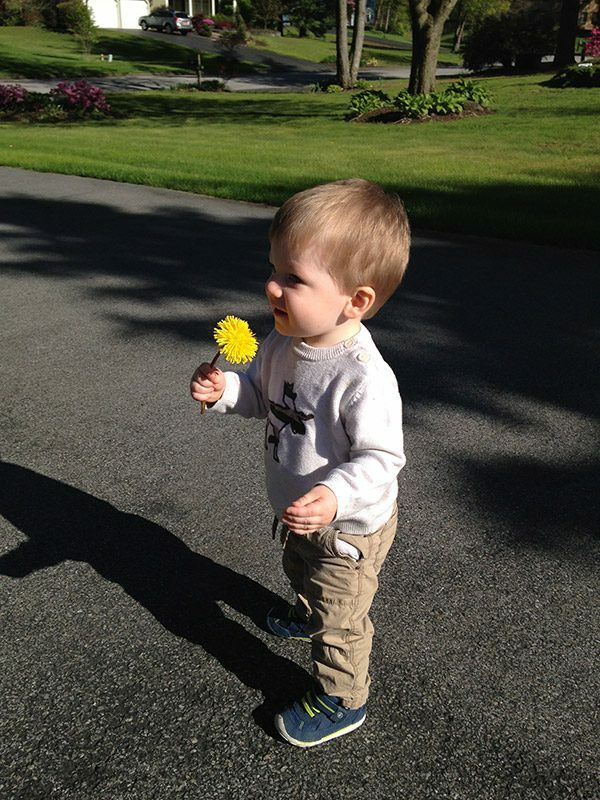 And he was so proud marching around the yard with his dandelion in his hand! Just like his Dad, Robbie has a thing for fruit. It doesn’t matter what kind of fruit. He loves it all! So during our Week of Fun, I decided it would be fun to whip up a smoothie for the little guy. He’s recently figured out how to use a straw, too, so that’s a bonus. I mean I can’t imagine him trying to drink a smoothie without a straw! Dad would’ve been cleaning up that mess for an hour. Hah! Have you guys ever used toasted oats in a smoothie? Hint: Do it. They’re delicious! 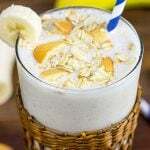 Using oats in a smoothie is a fun way to add extra fiber and protein, and toasting those oats adds a whole new level of flavor to your favorite smoothie. For this Pineapple Peach Oatmeal Smoothie, I used pineapple (or babbles as Robbie calls ’em), peaches and a banana. Toss in some vanilla Greek yogurt, and you’ve got a creamy, fruity glass of deliciousness! Robbie and I sat on the back porch sipping on this smoothie. Well, he sipped while I held the glass. But he loved it! That’s no surprise at all, and I’m definitely going to work smoothies into the regular rotation for the little guy now. We love making smoothies around here in the summer, and I make sure to always keep frozen fruit on hand. (I like using frozen fruit as it yields a thicker smoothie without needing as much ice.) 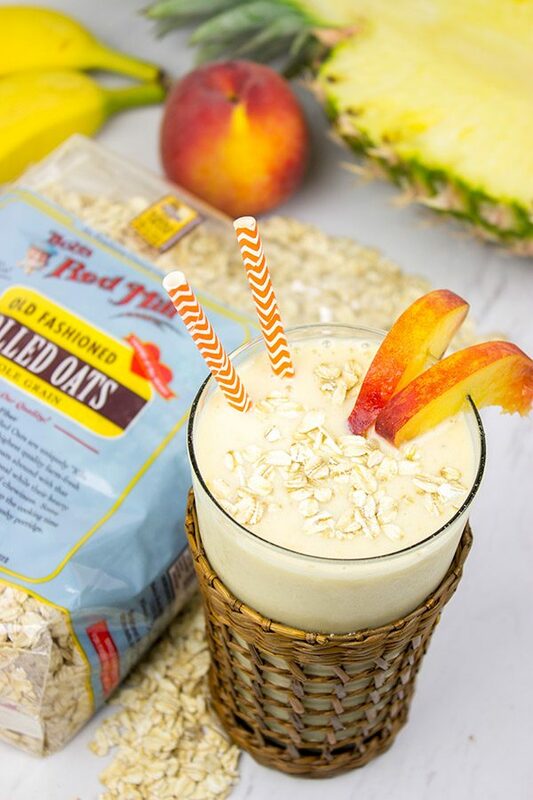 This Pineapple Peach Oatmeal Smoothie is definitely going to be making an appearance again soon. Place toasted oats along with all other ingredients into blender; blend until smooth. That picture of Robbie smelling those hosta leaves is priceless! He has grown so much since we saw him – what a cutie pie he is! 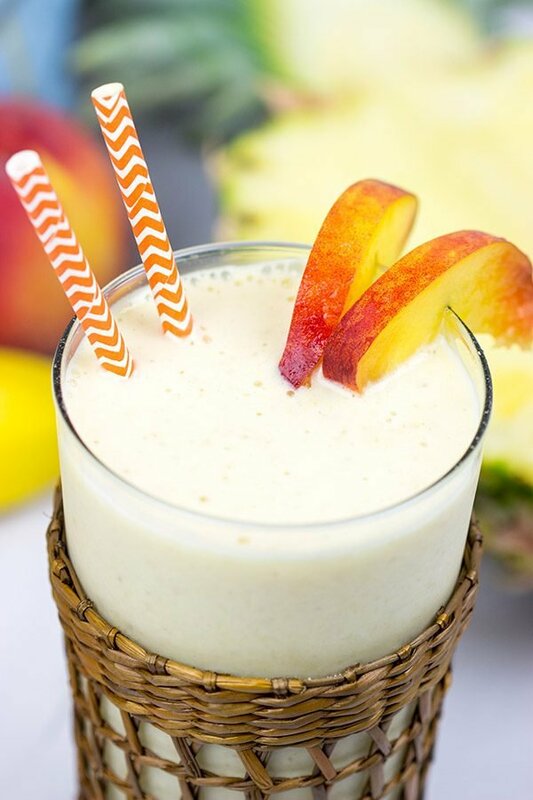 As for this smoothie – I love using frozen fruit as well as oats in my smoothies – and so LOVE the combo of Pineapple and Peach together – though it’s been a long while since I enjoyed them together in a smoothie. Since Lil Shashi and I are having the missing-Portland blues today, I need to whip up this smoothie and get her to join me on our deck – like you and Robbie – though if I were holding her cup, I’d probably be taking more sips from it that she would get to! Happy Wednesday, my friend – I got some catching up to do round these parts! Oh my goodness, has he ever grown up! Laura and I keep saying ‘when did he go from a baby to a little boy? ?’ You’ll have to make your way up here again sometime to visit! I hope you guys had a blast out in Portland, Shashi. I can’t wait to see some photos! 🙂 And I totally agree with you about the combo of peaches and pineapple. It just screams summer in a glass! Thanks so much, my friend! This smoothie is such a pure bliss!! and loved reading the bonding between son and dad 🙂 No words to describe it!! And Hello Robbie!! Why thank you very much, Sharmila! I’ll be sure to tell Robbie you said hello. 🙂 I’m thinking I need to make another batch of smoothies for him this weekend…it’s supposed to be really hot here! Robbie is the most precious thing ever! I love that pic with the dandelion :). But oh, poor Laura! I think if Cookie cried when I came home after a week away I’d be scarred for life. I almost always add oats to my smoothies because I love the texture but I’ve never toasted them first. 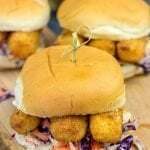 That’s happening for sure next time I make one! Hope you’re having a great week, David! Hi David. I only make smoothies occasionally, but when fresh peaches arrive I will definitely try one with toasted oats. 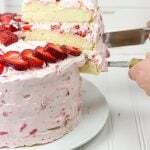 Don’t you sometimes just want to go hands in, instead of the adult way with utensils? Robbie is quite the little man! When my son was his age I was always the one who went to him if he cried in the night. On the rare occasion my husband did, Jason would move to the corner of his crib and wail even louder…he was just used to me being there. Oh, don’t even get me started about fresh Southern freestone peaches, Dorothy! You know how I feel about Southern peaches…and sadly, I can only get them up here on rare occasions if I’m lucky. Robbie has been sick this past week(ish), and he definitely just wants his mom to hold him. There’s something about the mom touch, right? 🙂 But Dad makes smoothies, and that makes things better! Thanks so much, Dorothy!! I was just thinking about you and Gary the other day. I hope y’all are well! If you can understand Latin, you can understand toddler talk 😉 So cute with Robbie smelling everything! And how awesome is it that he loves all kinds of fruit?! High five for that! Hubby and I have a smoothie every single day (well, Monday-Friday) and we actually really look forward to it. I love trying different combos and particularly love those with blueberries. 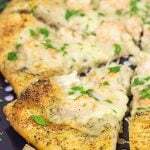 Going to have to give yours a try next time; lovely touch with the toasted oats! Bit more in there to fill ya up, which is perfect! Hahaha…if only that worked, Dawn! I can sit and have a conversation with the Pope, but I can barely understand my own kid. Everything sounds like “bubba” to me! 🙂 I really enjoy adding blueberries to my smoothies, too, but I gotta say the peach + pineapple flavor worked well. Do try adding toasted oats sometime. It’s a fun addition, and it adds a cool layer of flavor in there. Thanks, my friend!! I’m so scared to put oatmeal in my smoothies. I know that sounds super silly but it’s the truth. I try to drink a green smoothie every morning, but I don’t mind adding this peach to my list. I bet you had a fun and exhausting time playing single Daddy, no more bachelor time for you David, and I’m sure you are a-ok with that. I would pay to see a picture of Robbie smelling flowers and you just gave it to me for free. So adorable. Ok, Mary! Here’s the thing. You gotta take the scared part and throw it out the window…at least when it comes to cooking! I mean, what’s the worst that will happen? You might not like the recipe? 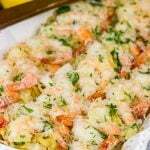 I’ve had plenty of duds in my time in the kitchen, but I’ve also stumbled across a lot of new favorites, too! And toasted oats in a smoothie? Definitely a new favorite! The toasted oats add a fun layer of extra flavor. Just lightly toast the oats in a dry frying pan (tossing often) for like 3-4 minutes…or until you can smell them. That’s it! It’s so cute that you’re teaching Robbie to stop & smell the flowers! Yum, I’ve been all about smoothies lately & have been using frozen peaches in mine too. I’ve used oats in smoothies but never toasted ones – I’ll have to try that! Haha! Well Robbie and the flowers started with actual flowers. But then those flowers died, and he just started smelling leaves instead. But it’s just too cute! 🙂 Do try toasting the oats before you add them in a smoothie. It’s a whole new (and rather fun!) 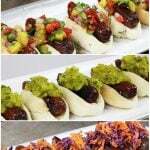 layer of flavor. Thanks so much, Nicole!! This looks like a fantastic Daddy-Robbie week – I wonder who had more fun Daddy or Robbie? 🙂 So nice that you included a picture of Robbie smelling the hostas – put a big smile on my face. He is so sweet and you are so lucky that he loves all kinds of fruit. Just bought some beautiful ripe peaches yesterday and was wondering what I could make with them – thanks for the solution. 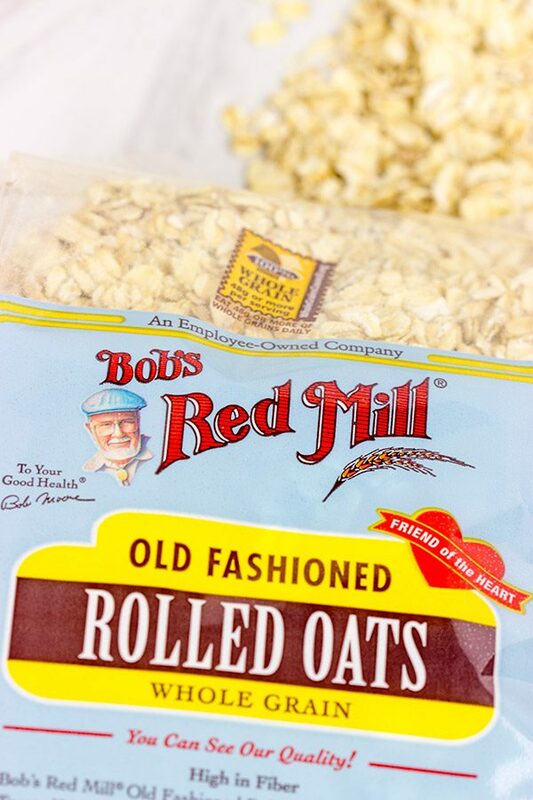 Bob’s Red Mill products are great and I am happy that I am able to buy them in our Wholefoods store. So Robbie and Daddy both had a lot of fun that week! I think Robbie had more fun, though. Plus, Daddy was totally wiped out each night. I think I could have just fallen asleep on the couch each night and not woken up ’til morning. 🙂 The fact that Robbie stops and smells hostas is just too hilarious! And I don’t have it in me to tell him that he should only smell the flowers. Haha! That’s awesome that you guys can get Bob’s Red Mill products over there in London! They really are one of my favorite companies, and we keep all sorts of their products in stock in our pantry. I hope you’ve had a great week, Miriam…and I hope you have an even better weekend! I’ve added oats to smoothies before, but not toasted ones. Must try that. 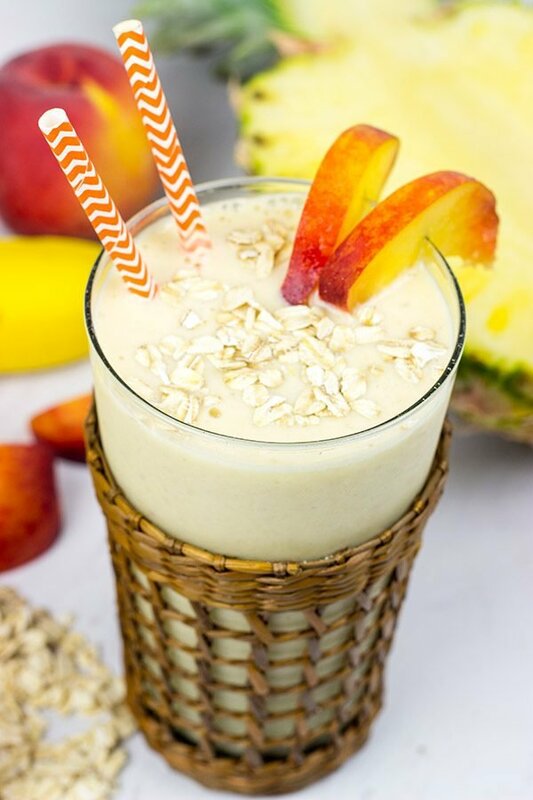 And this pineapple peach oatmeal smoothie sounds so delicious and refreshing. I was wondering where all the summer smoothie recipes had gone as there’s normally lots out at the moment for me to try, so yours looks like the first, so thanks for this David. And you guys have a fantastic weekend. Here’s hoping that the rain holds off so that you and Robbie can get even more quality time in the garden! Definitely try toasting the oats first, Neil! It adds such a fun new layer of flavor to the smoothie. But watch ’em closely. Burnt oats are not the flavor you’re going for. Haha! 🙂 And this smoothie is definitely a fun way. As Dawn noted above, I often like to add blueberries to my smoothies, but this was a fun tropical twist. And since I like to use frozen fruit (for a thicker smoothie), it means I can make this one year round…like in the dead of winter when I need to channel some warm thoughts! Speaking of warm, it’s supposed to be really warm (hot even) this weekend, so you can be sure Robbie and I will be out in the garden! Thanks so much, my friend! David, this is exciting! You should plant some lavender and edible flowers. Since Robbie is having a flower kick now, we need to use this time to teach him some important (and beautiful) things. This tropical smoothie sounds great too. I love adding oats or peanut butter cause only these 2 ingredients make a smoothie wich will keep me full at least for a while. If I have any other kind of smoothie, I will be hungry like in 15 min hah. But I would have never thought of toasting oats. This elevates an oat smoothie to a new lever. Hmmm…I do see the point that you make here, Ben. Robbie does love flowers, and I love to garden…but lavender is a bit of a stretch! Also it would smell amazing. 🙂 But then I wouldn’t know what to do with it after that. Haha! Do try toasting the oats before you add them to your smoothie. It’s a whole new layer of flavor, and it’s kinda fun! Thanks, my friend!! How cute is that picture of Robbie smelling leaves?? OMG he is so big and so cute! I love that he loves fruits, that’s like half of the work already done! This smoothie looks so appetizing! Have a great weekend! Robbie really is growing like a weed lately! Laura and I keep looking at him and wondering when he turned into a little boy…it feels like he was just a baby! 🙂 So he might love fruit, but veggies are proving to be rather difficult. I wonder if I could turn them into a veggie smoothie? haha! Thanks, Gaila!! Robbie is getting so big. Cute pictures of him. I have had oatmeal in smoothies, but not toasted oats. This smoothie looks yummy. My granddaughter loves helping make smoothies, this is the perfect one to make with her. You’re telling me, Dawn! I swear Robbie grows like an inch a day! 🙂 Do try toasting the oats next time you make a smoothie. 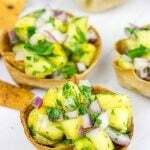 It adds a fun new layer of flavor to a summertime favorite! 🙂 Thanks so much! This sounds lovely. Fresh, tropical and filling at the same time. Man! That little guys growing up. The smoothie sounds great, and I love the wicker holders for your glasses. Geez…you’re telling me, Jeff! Robbie just keeps getting taller and taller. Soon he’ll be taller than me! 🙂 Thanks so much, my friend. Hope you guys had a great weekend over there in Chitown! Robbie is looking so cute David. I am really surprised that he loves oatmeal. Because my daughter doesn’t likes oatmeal at all. BTW this is my kind of recipe.